That might be a little too black for my liking. More photos, and the review by clicking the link. I actually first heard about this burger last month from a Huffington Post article about it, explaining the pun of the name. From what I found online, it seemed that the burger should have finished around the middle of August, and it disappeared from their website around that time, so I fully expected that I missed it, and wouldn't be able to try it when I was there. During my 7 hour stopover in PVG I made my way out of the airport to walk around and do some shopping before flying back to Singapore. I walked into a couple branches of McD's, (even if I don't plan on eating right then and there, sometimes branches have promos that others don't, for example, once in Japan, I saw a branch in Narita break the street date on the new Big America burger, so I was able to try it 3 days early!). 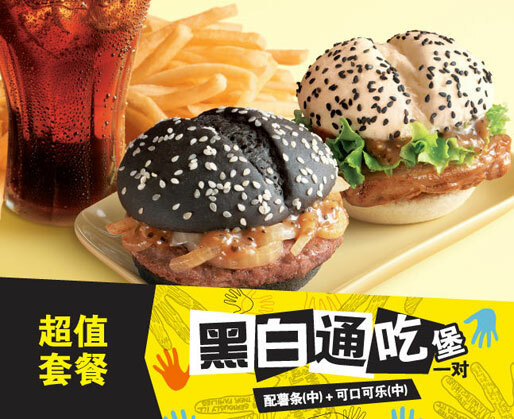 It seemed that the new promo burger for this month was a Angry Birds marketed Double Fillet O' Fish burger, which is hardly special, but my persistence paid off when I popped into the IFC Mall branch and found that they were still selling the Black and White Burger! All their promo signage on the outside of the restaurant was for the Angry Birds burger, but they had a small 30cmx30cm sign of the B&W burger up near the register, so you know exactly what I ordered. Before I talk about the meal. First I want to make a quick comment about the branch. This was easily the most civilised, quiet, and diner friendly McDonald's I have ever been to in Mainland China. Usually I have to elbow my way through a massive queue, hunt for a seat, dodge piles of uncollected trays and be almost deaf due the noise of the diners. This branch was quiet, had friendly staff and was spotlessly clean. Next time I'm doing a McD's run in PVG, I'll be visiting this branch. The burgers were delivered quickly, and both were hot. I knew this burger shouldn't have still been on sale, so I actually did a quick check to see if the buns were still fresh, which they seemed to be, but anything at McD's has enough preservatives in it to be 'fresh' for months, so I really wasn't expecting a mouldy bun or anything like that. 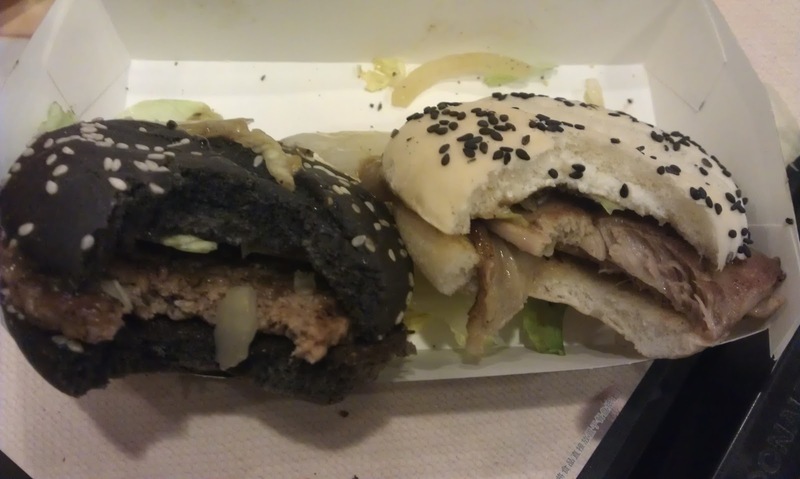 What struck me first was the darkness of the bun, when they mean black, they mean proper-black. 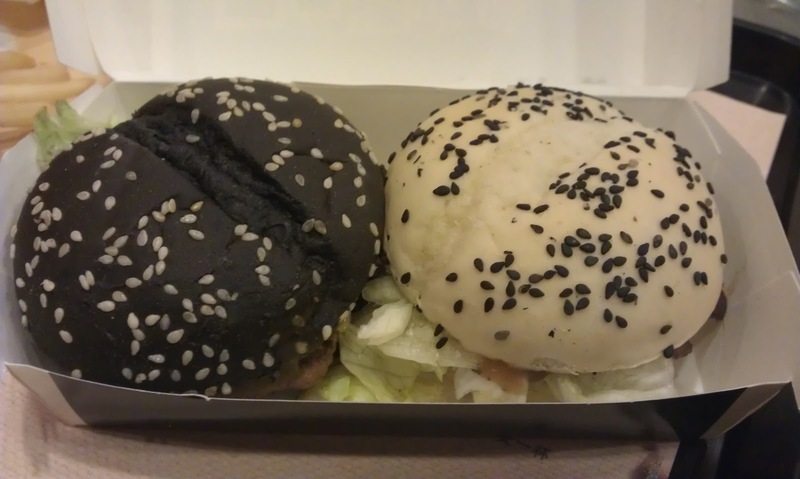 I assumed at first it might be a rye or other dark bread bun, but this seemed to be the same exact same white bun from the other burger, but dyed a shockingly dark black. So I guess I get a spoonful of colouring along with my preservatives...lovely. The scariness of the bun led me to try that first, which was the bun, with a smallish beef patty, onions, topped with a slightly spicy sauce. 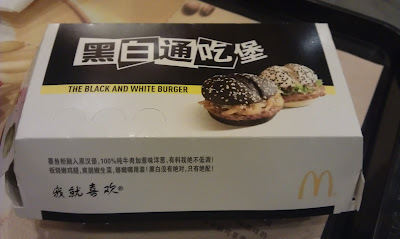 I was glad that unlike other 'spicy' McDonald's burgers they didn't top it with mayo, so it actually allowed me to taste the spicy sauce, and with the addition of onions, I rather enjoyed it. The second burger was a white bun, with lettuce, a small piece of grilled chicken thigh, and a different, spicy but sweet sauce. The piece of chicken was slightly larger than the beef, and though these are small burgers (2 = one regular burger), the buns are actually pretty thick, so the larger piece of chicken balanced out better with the bun than the small beef patty did. The sauce was spicy, but it was a different kind of sauce, where the Black burger was just plain spicy (similar to the McPepper) the sauce on the Chicken had a sweetness to it, but still had enough kick to be called 'spicy'. I'm glad I was able to try these, as I enjoyed them. They looked pretty cool, but I'm sure whatever is in the dye to make the burger black is terrible for you, so I'm glad I won't be able to keep eating these. 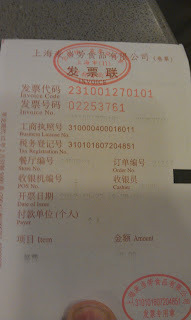 The one thing which bothered me, was I was NOT allowed to buy this outside of a set meal (combo). I try to avoid eating the fries, but apparently this was 20RMB as a combo, or still 20RMB without the fries and drink...That prevented it from a perfect rating.